The boyfriend went to India for work(!!!) a couple of years ago, and brought me back a beautiful silk sari. I had been sitting on the fabric for about 2 years, waiting for the perfect pattern. 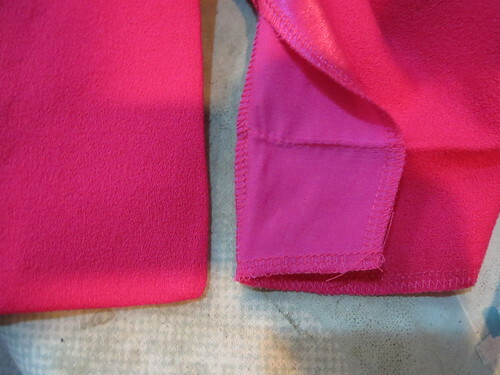 The fabric is excellent quality but lightweight, so I didn't want anything that would put too much strain on the seams--but I can't wear shapeless so it had to have some waist definition. A tall order! 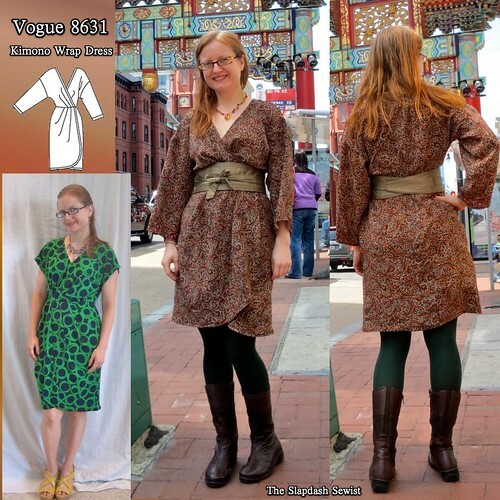 I made my knit version of Vogue 8631 as a test of the pattern for my special fabric and it passed the test. I am hoping that the kimono look is one that never goes out of style. Here is a Carolina Herrera ($799 on Gilt Group) version. Other than making it in a woven, adding a zipper, and using the long sleeve, I didn't change a whole lot from the last version of this dress I made. I had already adjusted the crossover not to gape on my small bust and everything else fit pretty well. The only real change I made was to add some length to the bodice. I have a long torso despite my petite stature, and I found the waist on the knit version verging on too high. I added an inch above the waist and the woven version sits just about perfectly. Although I really like the tulip-y shape of the hem as drafted, I wanted just a skootch more coverage and overlap, so I cut it with a little more width at the rounded edge. While a strong wind can still blow it open (I always wear a slip under, of course), it has good overlap and in normal circumstances provides ample coverage. Let's talk about this fabulous fabric for a moment. It was such a lovely and thoughtful gift! As a traditional sari, it had a scarf piece, or "pallu" on the end. 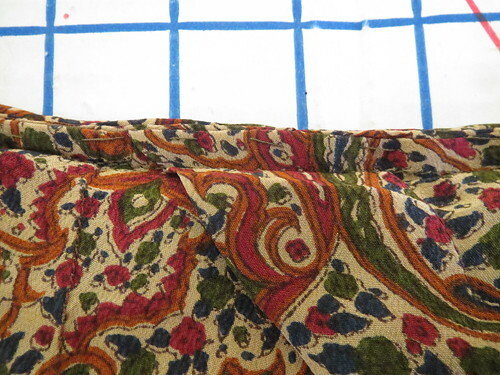 I cut this off and hemmed the edges to make a scarf, which I wore with my Tweed Ride outfit. 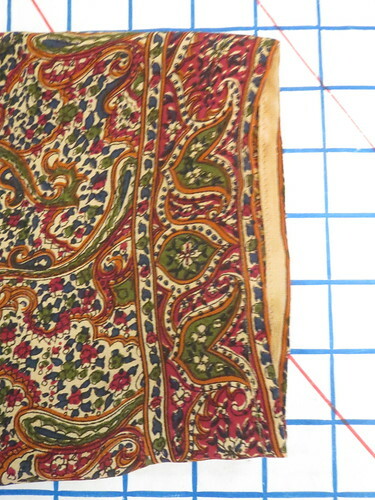 It also has a double border on the remainder of the fabric. I cut the sleeve hems on one of the borders. And that was the extent of my intentional use of the border. When cutting the skirt, I somehow forgot that the fabric was a double border. I carefully avoided the border on opening edge, but then completely forgot about it for the side seam edge. Oops! Luckily, the fabric blends so well that I don't think anyone will ever notice this phantom border. To finish the edges of the dress, I made a million yards of self-bias tape. Because it's a wrap the bias is a continuous circle all the way around the neckline/wrap openings. It was so much self bias, but worth it in the end for the lovely finish. The bias tape blends in so well that if I didn't know how it was done, I might think it was magic. 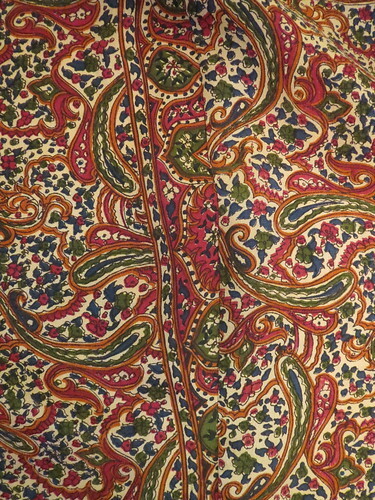 The pattern is drafted to be worn as a true wrap, held together by inner ties. I am not crazy about inner ties--they are so fussy to tie and then if you need to readjust you have to get all the way undressed to do it. 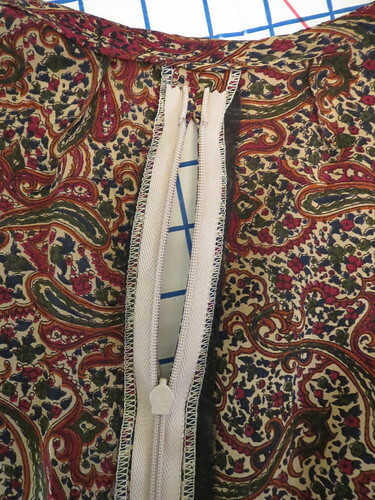 Instead, I put a zipper in the center back seam, interfacing the opening to support my lightweight fabric. To get a nice clean finish at the back neckline, I closed it up about two inches from the top and installed the zipper below that. The neckline is plenty wide to pull over my head. 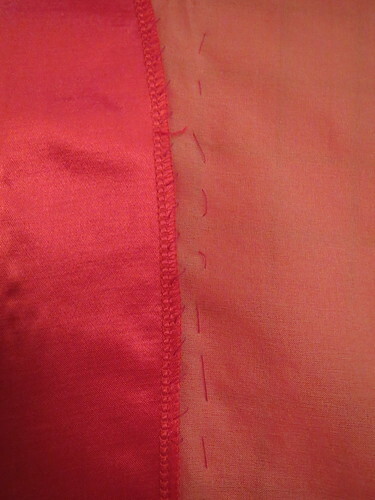 To keep the dress together, I hand-sewed the two fronts together at the waist's seam allowance. This makes it much less fussy to wear. I do need to keep an eye on my stitching and make sure it doesn't pull out. That would be quite the wardrobe malfunction. The only thing I wasn't sure about for my sari silk version was the dropped shoulder. I do not care for a dropped shoulder and it does not do anything for my petite frame, where shoulder width is always a challenge anyway. But changing the location of the shoulder would have required extensive redrafting, so I decided to just risk the shoulder as drafted. 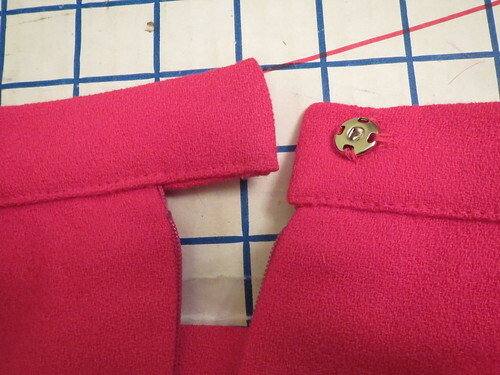 The only small issue in the finished project is not the location of the shoulder--with the wide sleeves it doesn't matter so much where the shoulder is located--but that my French seam sticks out a bit, emphasizing the dropped location of the shoulder. 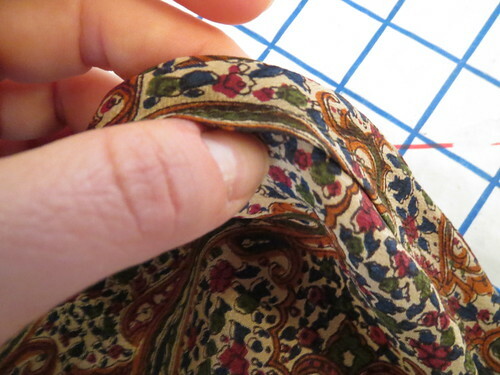 But this is a tiny nit that I think only someone who sews would notice. I was so happy that not only did I finally find a pattern for my special fabric, but the project also worked out just as I envisioned. It drives me crazy when I finally cut into a Too Good To Use and then the project ends up being meh and I only wear the finished item a few times before bitterly parting from it. This special piece will be in my closet for years. My only dilemma is styling. I love the way it looks with the obi, but is that just too literal? I feel like it needs something at the waist, and a narrow belt doesn't look totally great. But perhaps that is just my obsession with always have a scarf or belt at the waist. And fabulous photos they are! I wore this to the DC Area meetup a couple weeks ago and SewandWrite took these wonderful photos in front of the Chinatown arch. But of course that wasn't really the point. The point was to eat some yummy food, gab about sewing, and of course swap fabric and patterns! I forgot to take a picture, but I brought a *huge* bag full of fabric to give away. I felt very virtuous for only bringing three pieces home with me. I couldn't pass up that gorgeous knit print, and I had just been thinking that week how I wanted a water-repellant fabric to make a bag to go in the basket of CaBi bikes. At the last sewing meetup, the fabulous DD was wearing some drop-dead leggings she made of McCall 6404. I immediately wanted to copy her. Not be inspired by, but straight up copy. She very kindly agreed to pick me up some pleather at Hancock's next time she was there. And meanwhile the pattern had gone out of print, but luckily BMV had an out of print sale and I got it in my hot little hands. True to her word, DD brought me the pleather to our meetup. I can't wait to make the leggings! It will be a while yet before I get around to them. First, you can probably guess that I have been working a.lot. the past couple months, and it's not going to slow down anytime soon. I hope to get back to more regular blogging someday. Second, after almost a year of not wanting to do anything complicated, I finally got in the mood to do a hard project. I've been plugging away at it for nearly a month now and am not even halfway done. Maybe I should rethink that "wanting to do a hard project thing," LOL. But it will be cool when it is done, I think. There will be a big reveal...someday. After a long stretch of unappealing, Burda finally started getting interesting again late last year. Burda 09-2013-105 was one of the patterns that went on my list as soon as the magazine arrived. It has a pencil skirt silhouette, but the front wrap/split means that it's fairly bikeable. Perfect! I shortened the skirt three inches before cutting and still had a generous hem allowance for a skirt longer than I usually wear. This would have been mid-calf had I not shortened it. Because the shapes of the front openings is the major part of the design here, for my short legs the skirt needed to be at full knee length so the graceful arcs would have their full space to be graceful. When I pinned it at a shorter length it lost a bit of its sophistication. I love wool crepe for office clothes. The only downside is that it wrinkles almost as much as linen. To attempt to keep the wrinkling slightly under control, I underlined it with silk organza. I stitched the silk organza as one with the fashion fabric at the darts and the seams. 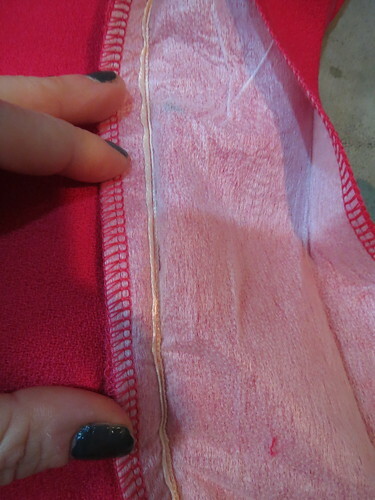 To keep the organza in place I hand-basted it 1/2 inch in from the seam allowances. Yes, I hand basted. You can also see where I hand stitched the facings to the organza. I was afraid that with four layers of fabric at the front waist and belly (two wool and two organza) it would be bulky and add unwanted depth to the gastric region, but it actually sits surprisingly flat. 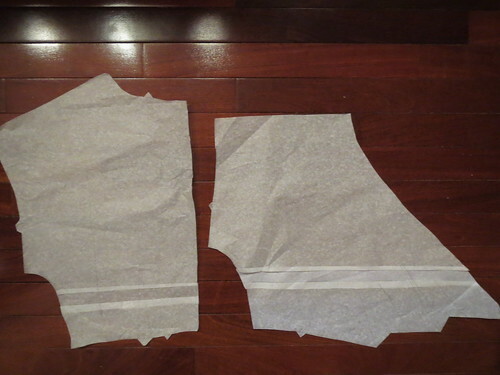 When cutting the facings for the skirt front opening edges, be sure to cut them wrong side of the fabric up. Mirror images always trip me up. I first cut them right side up, as I had the skirt fronts, and was then surprised when they wouldn't match up with the fronts. 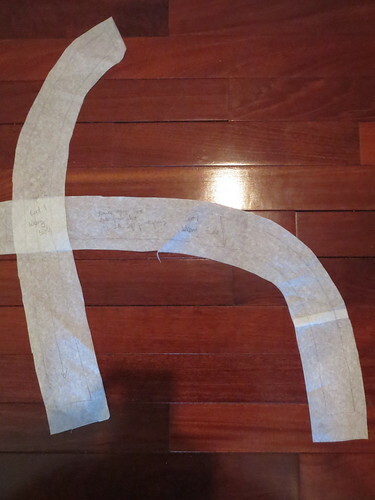 I made a huge note on the pattern pieces to remind me for next time. The pattern is not drafted with a lining. Another downside of wool crepe is that it is surprisingly sheer, even when the fabric is relatively thick. Wearing a regular half slip to deal with the problem was out because of the shape of the front slit so I lined it with a satin rayon. 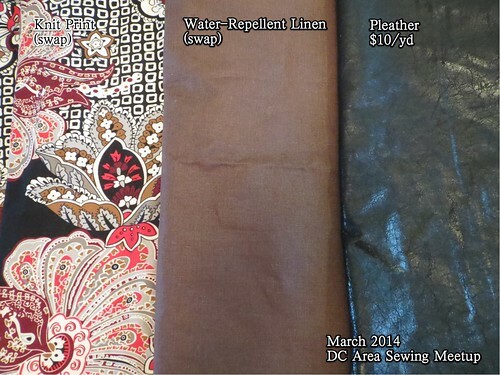 I bought 3 colors of satin rayon when Fabric.com had them on sale in September 2010 for $2.97/yd. This was the last of the hot pink and I am sad to see it end. I've looked for satin rayon for linings since then and never found any as nice at a reasonable price. I should have bought their entire stock. To cut the front lining I used the pattern piece for the right front, which has center front conveniently marked. I placed the CF marking on the fold and cut. The darts on this are fairly wide set and really do sit well over my abdomen. Normally I get some puffing but it is not noticeable here. 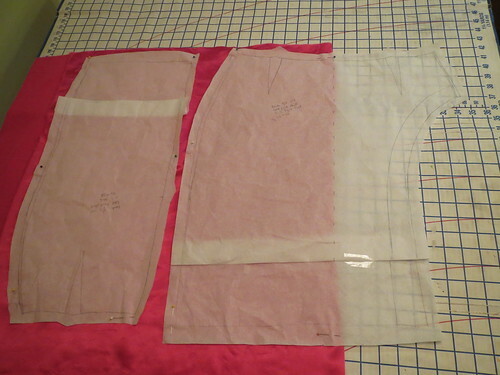 I might give this pattern a try as a plain pencil skirt, cutting using the same method as for the lining. To keep the lining from showing through at the front slit, I did not come up with an elegant solution. I didn't want to use the skirt pieces as drafted and have SIX layers (two wool, two organza, two lining) in the front. That just seemed like too much. I just cut a big ol' upside-down U shape out of it and did a serger rolled hem on the edge. If I make this again, I will likely just underline with the lining fabric and call it a day. The pattern is drafted with waist facings, but a waistband is much more flattering on me. I can never figure out tucking with a non-waistband skirt, and I feel like the skirt collapses and creases more at the front from sitting without being held in place by a waistband. I just cut a straight strip of fabric for the waistband, which I interfaced for stability. To attach it, I first stitched the right side of the waistband to the wrong side of the skirt. 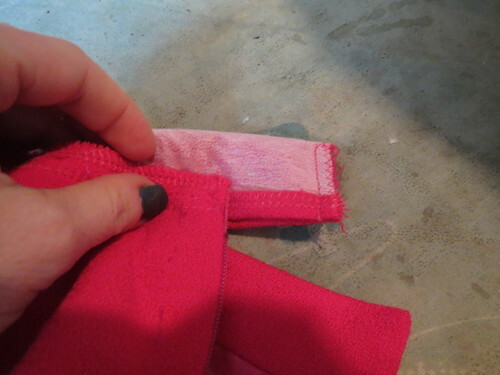 I sewed a ribbon into the stitching to stabilize the waistband and keep it from stretching. Then I folded under the seam allowances on the other edge and folded it over to the right side and stitched. The only tricky part was that I was having one side of the waistband overlap at the back and close with a snap. 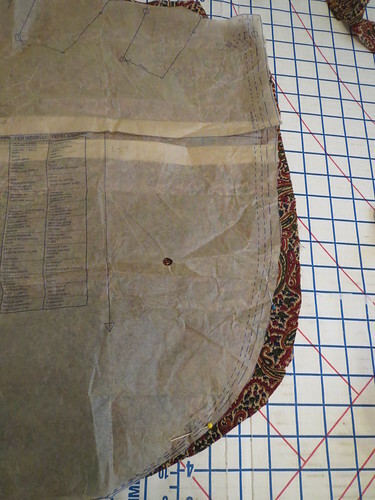 For the squared off side of the waistband, I folded it so that the lower folded-under edge of the waistband on the outside that would be topstitched down at the front was longer than the back, ensuring the first row of stitching would be covered up. For the extended tab side, this wouldn't work and I had to line up the two folded edges evenly, gradually changing the matchup as I got closer to the skirt, and then extending the front beyond the back to hide my stitching from sewing the first pass of the waistband to the wrong side of the skirt. The finished waistband looks pretty good (not perfect) on the outside and the inside. To get neat corners at the hem of the front slits, I used the slit facings. First I sewed the slit facings in place (before constructing the skirt--they have to be finished before the side seams are sewn). Then to hem I folded the slit facings to the right side and sewed the hem, right side of facing to right side of fabric, as far as the end of the facing. Trim the seam allowance, turn and press and you have a nice neat corner. 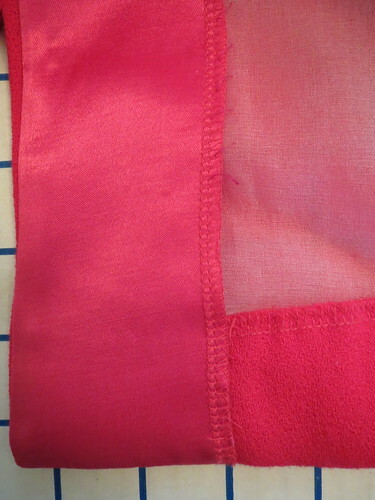 To finish the hem, I hand stitched the fashion fabric to the organza so it would be invisible. I am quite proud of how careful I was with this skirt and did everything "right." The only unsatisfying thing is that the upper front does not side quite flush against the under front. I was very careful in putting it together, laying it flat on the table and making sure everything lined up exactly. What I *wasn't* thinking is that I am not shaped like a table. Two pieces that sit together perfectly on a flat surface don't necessarily do so on a cylinder. I should have folded up a towel to create more of a rounded human shape to line up the front pieces. I'm sure eventually I will undo that side seam (serging and all, ugh) and align the front pieces better, but I have not been in the mood yet. That quibble aside, I do like this skirt a lot, and it is fairly bikeable (not total freedom of movement to swing my leg over the frame, but it is possible without fearing ripping the skirt). I love the color, but it made it a bit impossible to photograph as the camera just didn't know what to do with it--most of the photos are a little out of focus! I redid them, but the second set was worse than the first.